Originally homesteaded in 1790, the stonewall farm residence was erected in 1839-40 by Captain John Shouse. Shouse partnered with James Coleman to turn the property into a proper farm. In 1852 the farm passed to Major Warren Viley, who was a typical southern gentleman and established the farm in what would be known as a world renowned thoroughbred stock breeding property. Warren’s grandfather (Captain Willa Viley) assisted in starting the long Kentucky tradition of horse racing when he helped to establish a racetrack at Lexington in 1826. One horse owned by Captain Viley who can be attributed to his prominence as a thoroughbred owner was Richard Singleton. This famous Kentucky racehorse established himself as a starter in fourteen four-mile-heat races and winner of all but two. These achievements were made in 1832 – 33. In one noted race, he ran sixteen miles, winning three heats out of five. 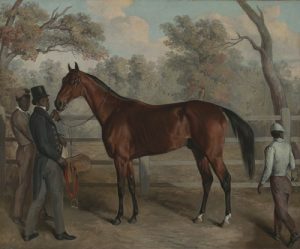 At that time he was undoubtedly the greatest racing horse in Kentucky.1 A famous painting of Richard Singleton by Edward Troye now hangs in the Virgina Museum of Fine Arts. Warren continued his grandfather’s tradition in raising outstanding thoroughbreds by breeding such winners as King Al-phonso & Capitola as well as many other well-known Kentucky historical thoroughbreds. On Stonewall farm, many notable events were forecast in gatherings of distinguished men. This was particularly true during the period that preceded and immediately followed the Civil War. Several traditional Kentucky barbecues on the farm launched successful political careers. Notably those of John Cabell Breckinridge, James B Beck, and Jo. C. S. Blackburn. Each of these men, who were good friends of Mr. Viley, cast his hat into the political arena at Stonewall Farms. “No home in the county ever dispensed a more genuine and unaffected hospitality that that displayed by the head of the family at Stonewall Farm.” – Lister Witherspoon. One of the most distinguished guests to Stonewall farm was the thoroughbred Lexington, Leading sire in North America 16 times, who stood stud at the farm in the 1860s and ’70s. During the American Civil War, horses were forcibly conscripted from the Kentucky Farms to serve as mounts in the bloody fray. Lexington, 15 years old and blind, had to be hidden away to save him from such a fate. 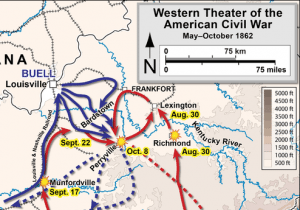 The Civil War affected Woodford County in a terrible way. Stonewall Farm, located in Versailles, was prepared by Confederate General Braxton Bragg’s Army of the Mississippi for a grand conflict with Major Don Carlos Buell’s Union Army of the Ohio. On October 8th, 1962, the battle was actually engaged in Perryville, just south of Versailles, and named the Battle of Chaplin Hills. The battle was considered a strategic victory for the Union, where they maintain control of the area until the end of the war. After the Civil War, Stonewall farm continued it’s dominance in raising top-performing thoroughbreds up until the modern day. Recently, the farm has been home to a number of famous horses including 2007 American Champion Lawyer Ron, 2005 American Champion Leroidesanimaux, and stakes winners A. P. Warrior, Marquetry, Doneraile Court, Da Stoops, and Medaglia d’Oro, who sired 2009 Preakness Stakes winner Rachel Alexandra.